Hi folks! It may just be the 70 degree weather change in a 2 day span talking (!!!) but we're feeling ready for spring. If you're looking for a great quilt project with plenty of warm weather vibes, we love the Ice Cream Cone Quilt pattern KH Quilts. And what's more, she chose the lovely PIxie Dust in Chamomille print from Indy Bloom's Hello Spring collection, printed right here in our shop. Our Quilting Cotton and Poplin fabrics are available in various widths, up to 56" wide, which makes for quick quilt back! Throw pillows are lovely on Poplin or the Linen Cotton Canvas for a more durable option! While her debut fabric collection celebrated the more iconic British sights, Annie Montgomery, of MontgomeryFest fame, takes us on a tour of the softer side of London. On the way to Buckingham Palace, enjoy a leisurely stroll through St. James's Park, taking care to visit the swans that swim about duck island, and the Queen's flower beds. A palette of pretty pastels with a dash of navy for good measure makes this collection a lovely choice for welcoming the flora and fauna of spring. The fabric is printed right here in our shop, available in various widths on Poplin, Quilting Cotton, Linen Cotton Canvas, Rayon, and Jersey and Interlock Knit - Organic options too! Try our go-to crib sheet tutorial from Project Nursery! New from Monaluna organic fabrics, Macigal Creatures includes 8 prints in a rich, cheery palette. Pretty unicorns festooned with wildflowers slumber while fearsome dragons breathe fire, and mermaids, octopi and narwhals frolic amidst scattered stars. This collection will no doubt inspire lots of magical sewing projects! We have yardage and Fat Quarter Bundles. The Wildflower Ayashe Blouse is by Figgy’s, the dress is self drafted by Monaluna, but for similar try the Geranium Dress pattern. The Skater Shirt pattern is available from Monaluna. We have a selection of Striped Rayon fabrics from Art Gallery Fabrics. At 56" wide, these are great for timeless apparel pieces. 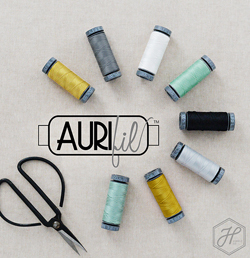 See here for the full selection of Rayon from AGF! New Quilt Kit from Tula Pink! Wear your heart on your quilt and show your love for Tula! 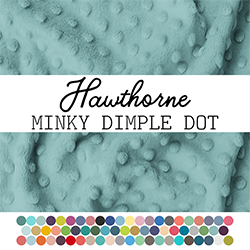 The new Faded Hearts Quilt Kit features her bright Zuma fabric collection. Composed of 12" blocks, this quilt finishes at 72" square. We have the collection back in stock and even had enough to cut more bundles! For our newest Giveaway we are offering up a Fat Quarter Bundle of Peony Pagoda from Corinne Haig! Congratulations to wendy_c27, the winner of a Fat Quarter Bundle of the I Don't Give a Ship collection from Dear Stella! Please send us a quick message to let us know where we should send this winning prize! Thank you so much for reading along with us, and for your continued support of our little shop! Kindest regards and happy making! 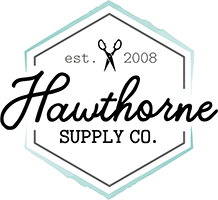 Hawthorne Supply Co. is an online fabric shop run in Upstate NY by a husband and wife team, Charlie and Lindsay.